Early Mornig tour to observe the sunrise, monkesys, and birds. Breakfast.land and boat transportation to Guápiles. Luncn and transfer to San José. Visit to the small town and museum and hiking to Tortuguero Hill. The maximum baggage allowance is 25 pounds per person. (Your hotel will gladly keep the rest of your items in storage). Do not bring valuables or lot of cash. What to bring: jeans, tennis, shoes, sandals, swimming suit, shorts, T shirts, hat, flashlight, mosquito repellent and film for your camera. Alcoholic beverages, sodas or bottled water. Optional morning tour: Enjoy nature at its best as you undertake a journey through the canals at dawn, and take your best shots of a real Caribbean sunrise.Breakfast, tour throught the cannals. Lunch. At afternoon, hike Tortuguero Hill (depending of the weather) or travel along the well-known Tortuguero Canals and have the experience of your life in this unique paradise of magnificent flora and fauna. At night, a delightful dinner will be served. Optional Night Tour: Walk on the beach and admire the green turtles nesting (July through September). Breakfast.Transfer from the lodge to San José by boat and bus.Lunch on the way. Round trip transportation from San José by bus (available by plane). Visit to the fascinating souvenirs centers of Sarchí, where the beautiful wood furniture, plates and other forms of folk art are made and sold. Typical lunch in Arenal Volcano Area. 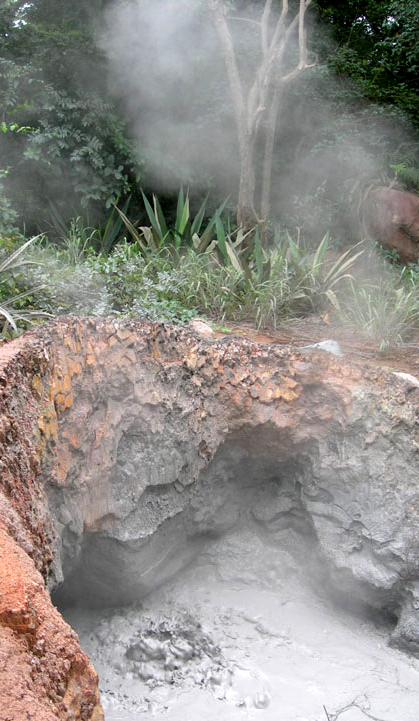 Visit to Baldi hot springs, where you can relax and enjoy the Arenal Volcano view. Taste a delicious dinner in the area. Overnight at La Pradera Hotel. Breakfast. Free morning to enjoy optional activities in the area. At afternoon, departure to San José with the shuttle bus. Round trip transportation from San José with the tour and shuttle bus. Taxes included (subject to change without notice). Transfer from San José to Monteverde Area with the shuttle bus. Free afternoon in Monteverde Area: enjoy any of the optional activities (not included in the rate). Overnight at Monteverde Villa Lodge Hotel. Breakfast. Visit to the Walkways, the best system of suspension bridges. You can observe a wide variety of plants, animals and even insects that are only found in the upper elevations and Canopy tour, slide by the ziplines through the forest. Overnight at Monteverde Villa Lodge Hotel. Breakfast. Free morning to enjoy the area. At afternoon, departure to San José with the shuttle bus. 02 nights of lodging in Monteverde. Round trip transportation from San José with the shuttle bus. Tour to the Walkways and Canopy tour. Optional (Not included on the rate) : Visit to Monteverde Biological Reserve. Enjoy Costa Rica for four days combining the majestic Arenal Volcano and Monteverde Cloud Forest, feel the peacefulness of the hot springs, enjoy the view of Arenal Volcano, and travel by boat in the Arenal Lake to Monteverde. Explore the cloud forest, enjoy a walk in the trails, and on the hanging bridges and observe a wide variety of plants and animals of the forest. 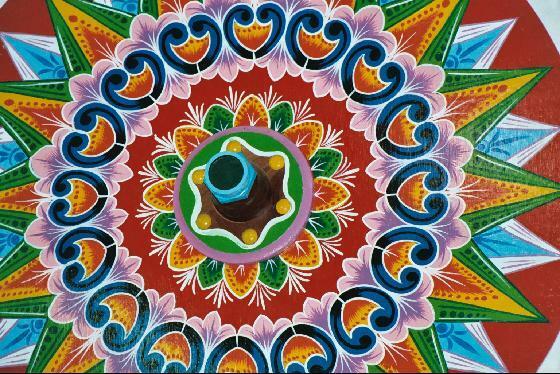 Visit to the fascinating souvenirs centers of Sarchí, where the beautiful wood furniture, plates and other forms of folk art are made and sold. Enjoy a typical lunch in a restaurant near Arenal Volcano.Visit the hot springs of Baldí, where you can relax and observe the Arenal Volcano. Taste a delicious dinner. Overnight at La Pradera Hotel, this hotel offers room with view to the volcano. Transfer by land and boat transportation crossing Arenal Lake to Monteverde Area. 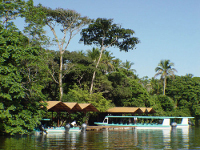 Enjoy boat transportation through the Arenal Lake and minivan to Monteverde Area. Free afternoon in Monteverde Area: enjoy any of the optional activities (not included in the rate). Overnight at Claro de Luna Hotel. Breakfast. Visit to the Walkways, the best system of suspension bridges. You can observe a wide variety of plants, animals and even insects that are only found in the upper elevations of the forest canopy. Then enjoy the canopy tour: feel the adventure at the zip lines in 15 cables and 18 platforms over the cloud forest. Overnight at Claro de Luna Hotel. Breakfast .Free morning, optional tours available. At afternoon, departure to San José with the shuttle bus. 01 night of lodging in Arenal Area. 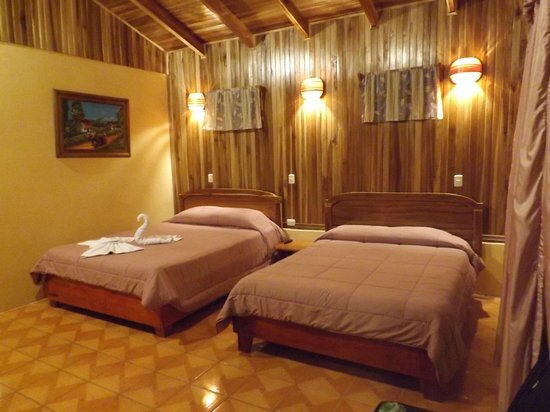 02 nights of lodging in Monteverde Cloud Forest. Transfer minivan-boat-minivan from Arenal to Monteverde. 02 breakfasts, 01 lunch and 01 dinner. Canopy Tour, Entrance to Baldí Hot Springs and to the Walkways. Enjoy the Central Pacific Coast and experience the warm waters of Manuel Antonio Beach, relax on the beach and feel free. Transfer from San José to Manuel Antonio Beach with the shuttle bus. Free afternoon at the beach. Enjoy any of the optional activities (not included in the rate). Overnight at Playa Espadilla Cabins, located few meters from the beach and from the entrance to the National Park. Free day at the beach. You can visit Manuel Antonio National Park where you can see variety of flora and fauna (monkeys, iguanas, birds). Overnight at Playa Espadilla Cabins. Free morning. At afternoon, departure to San José with the shuttle bus. Enjoy the South Caribbean Coast, the rain forest and so hiking and snorkeling in Cahuita National Park: it was created to protect the flora and fauna, coral reefs and various marine ecosystems. It is considered one of the most beautiful scenic areas of the country for its white sandy beaches, its many coconut trees, sea-blue turquoise and coral reefs. Shuttle bus transportation from San José to Puerto Viejo and vice verse. Tour to Cahuita National Park with snorkeling. Tamarindo has all the amenities of a Costa Rican beach town. It is the ideal place for honeymooners, couples, and families, and wonderfully suited to eco-adventures. Tamarindo offers first class sport fishing, sailing, surfing, golfing, ATV tours, turtle watching, diving, horseback riding, canopy tour, jungle boat rides, beauty spa, an art gallery and crafts and pottery stores. 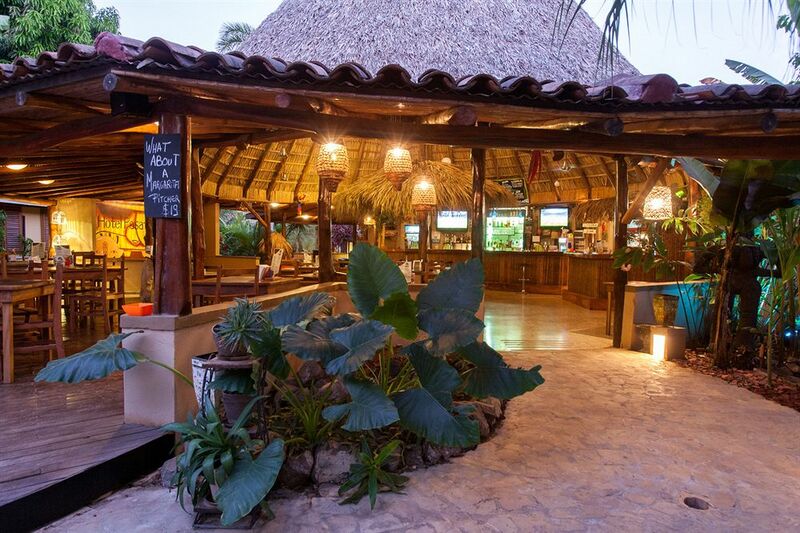 A multi-cultural community, Tamarindo boats several bakeries, an outdoors vegetable market and more than 40 restaurants. Whether you like to eat Vegetarian, 'Tipico' Costa Rican, Italian or Sea Food, it is all here. Accommodations are available for every budget, from luxurious beach-front hotel to hostels.Tamarindo beach is a three and a half kilometer stretch of white sand and warm blue water, it´s surrounded by National Parks to its north and south, and mountains with breathtaking views to its east. Nature is abundant, Leatherback Turtles lay their eggs in the northern part of the bay. Howler Monkeys are heard and seen swinging on branches throughout Tamarindo. 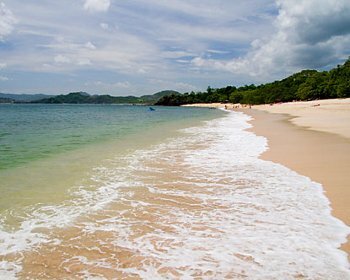 Transfer from San José to Tamarindo Beach with the shuttle bus. Free afternoon to enjoy the area. Overnight at Pasatiempo Hotel, this hotel is located this hotel is located just 5 minutes walk to the beach in the quiet part of the town, the rooms feature high efficiency A/C flat-screen, televisions with cable, comfy orthopedic mattresses with divine pillow-top, private bathroom with shower and hot water, safe box, and a little private terrace in front of your room. Breakfast. Free morning. At afternoon, departure to San José with the shuttle bus. 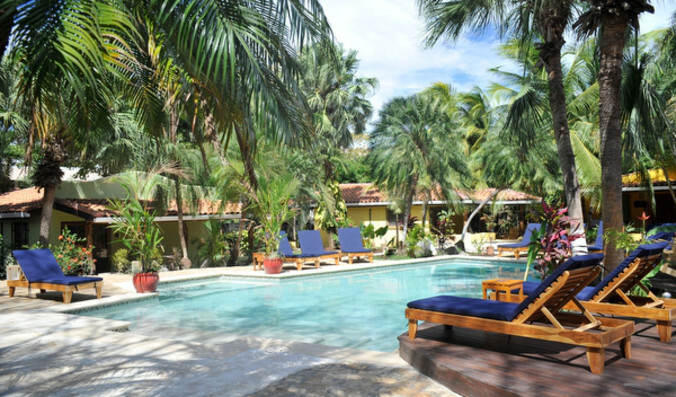 02 nights of lodging in Tamarindo Beach. Transfer from San José to Rincón de la Vieja Area with the shuttle bus.. Free afternoon to enjoy the area. Overnight at Hacienda Guachipelín. It is an ecotourism hotel for adventure trips and nature lovers. It is surrounded by gardens, close to the national park and offer activities like walking areas, trails, hot springs and many tours. Shuttle bus transportation from San José to Rincón de la Vieja and vice verse. 02 nights of lodging in Rincón de la Vieja. Tour : Horseback riding to Rincón de la Vieja National Park, hiking and visit to Oropéndola Waterfall. Rate: From $323 per person based in double occupancy. Discover in four days the unforgettable experience in the rain forest and feel the abundant wildlife and biodiversity of Corcovado National Park. Walk into the jungle trails, and enjoy the beach and snorkeling trips. Lunch. Free afternoon. Dinner. Overnight at selected hotel. Breakfast. Tour to Corcovado National Park: For a full day in the thick of the rainforest, Corcovado National Park is unparalleled for breathtaking beauty, abundant wildlife and foliage nearly pulsing with lushness. Walk along the beach with a local naturalist guide, where you can enjoy the guttural bark of howler monkeys and the shrieks of scarlet macaws. Lunch. In the afternoon, walk up the San Pedrillo River, leading to a rainforest waterfall great for a cool dip. Dinner. Overnight at selected hotel. Breakfast. Snorkeling tour in Caño Island with lunch included. Dinner. Overnight at selected hotel. Breakfast. Boat trip to Drake Bay airport. Domestic airflight to San Jose.